Afternoon Tea. The Traditional British we all love, known for finger sandwiches of all types, scones with a lovely doll of clotted cream and jam and to finish off with a selection of amazing pastries, and always with macaroons. 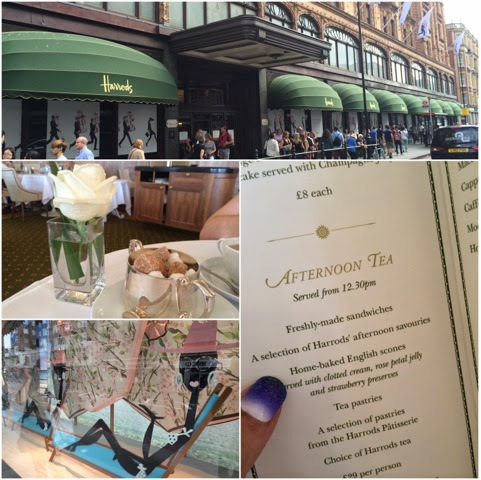 Today, me and Jess went to London and cashed in a gift of tea for two at Harrods, and enjoyed British culture at its best! I apologise my photos aren't very great, but me and Jess were too busy scoffing down the yummies and drinking unlimited pots of tea! I honestly love going out for afternoon tea and as much as I love my cakes and pastries, my favourite bit of afternoon tea is scones. How you say it is up to you but you say scones like you say stones.... The proper way! Just sayin'. But my point is... I love them, A LOT! We had the loveliest selection of sandwiches: coronation chicken, cucumber, roast beef and salmon. Fruit and plain scones with clotted cream and strawberry jam, and the cakes were just.... Mmmmm! The cakes were strawberry macaroons, lemon tarts, fruit cake, a layered custard pastry and what I thought was like a chocolate mousse slice! So good... All that topped off with breakfast tea! It was a lovely girly catch up with Jess, though we've seen a lot of each other recently, but it was nice to scoff our faces down just us two, and not give a care in the world as to what people thought! 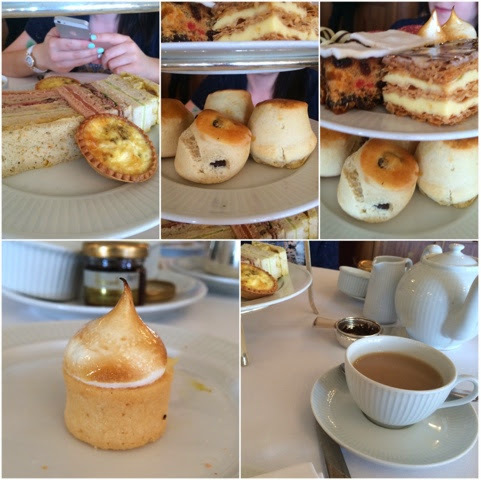 Screw afternoon tea etiquette... Eating finger sandwiches with a fork!? Hell no. Though a lady next to us was... haha! Apart from enjoying a lovely spot of afternoon tea, we wandered the massive department stores women's section and awed at the beautiful clothes we'd never afford and was very wowed at the bathrooms. They even have a cute vanity table in the middle with complimentary perfumes! I want Estée Lauder's Modern Muse now....! John and I will be going away for a couple of days this week, so I may be AFK for a little bit! Hold on, as there will be more posts, and some I have to catch up on creating. Hope you're all having a lovely week.